One of the most fascinating things about becoming Vassar Temple’s President is how it has helped me to focus on the question of growth — growth of the temple, and my own personal growth. The irony I am discovering is how much they are tied to one another. Personal growth starts with self-awareness and leads to personal struggle. So it is for the congregation too. Growth isn’t always measured in numbers. One way to measure growth is by how you feel. Do you feel better or worse than before? How can you and I feel better about Vassar Temple? I am sure there are many ways, but this letter is about one in particular. As President, I feel a greater sense of responsibility for what I say, which has made me more conscious of what others say as well. Both of which have brought me to consider a very Jewish concept about speech. There is a Hebrew term – lashon hara (לשון הרע or “evil tongue”) – otherwise known as derogatory speech, which is considered a very serious sin in the Jewish tradition (see Leviticus 19:16). Spreading a bad name or gossiping (hotzaat shem ra) is considered an even worse sin. The distinction between the two terms is that the former is based on true remarks and the latter on untrue remarks. As interesting as all this halakhic discussion can be to some, it also gets very heavy. So I will make my point. We have to watch our tongues. We can say things that build others up, or we can say things that tear people down. We can find the good, or we can find the bad. We can speak of growth, or we can speak of destruction. When you walk into Vassar Temple, literally, or conceptually when you think of Vassar Temple, I want you to feel accepted, safe and loved. No matter what! Regardless of your problems, faults, or fears. Do you? I believe one way to accomplish this is for us to speak in ways that build people up – to say things which build OUR temple up. Vassar Temple will grow by creating an environment where people can grow. Fortunately there is much to speak about positively, because many good things are happening at Vassar Temple. Even more than we can squeeze into the limited pages of our bulletin, which is filled with the ways Vassar Temple is building up people’s lives. Being a part of that is a wonderful feeling – a feeling of belonging. Teens from Vassar Temple’s Wednesday Night School and Youth Group once again helped make Thanksgiving happier for area families in need. 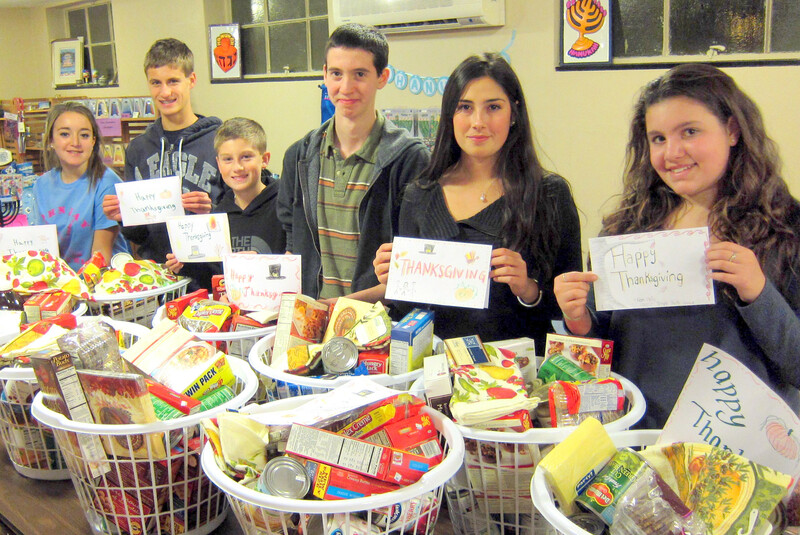 After a discussion led by Dr. Nancy Samson of the Social Action Committee that considered Jewish teachings relating to chesed and the giving of tzedakah, the teens put these lessons to work, sorting hundreds of nonperishable food donated by the younger children and by members of the general congregation. Then they carefully filled gift baskets with a variety of foods, and to top everything off they created a handmade gift card for each basket. The first few years we made 5 gift baskets. Then the teens voted to increase to 7. This year, due to the generosity of our congregation in donating ever larger amounts of trim foods, we were able to provide 10 baskets, twice the original amount we had started out giving! Since Sandra Mamis initiated the Turkey Trot project three years ago, we also have been able to include a frozen turkey with each gift basket. The families we are helping have overcome homelessness with the help of Hudson River Housing, and we are helping them celebrate their first Thanksgiving in their new real homes. Thanks go to our teens, as well as to each person who donated a can of gravy, a box of stuffing, a dollar toward a turkey, so that together we at Vassar Temple could make these families’ Thanksgiving dreams come true. Page 176 – The story of Isaac. is the shortest account of any of the three patriarchs but one of the richest portions in terms of interpretation. The middle story of any trilogy is usually the most interesting. There are references to Abraham but also suggestions as to what will come with Jacob. There are literally two repetitions of the Abraham story but told with slight differences. Note that after the sacrifice scene in Abraham there is no indication that they ever see one another again – suggestive of a frayed relationship. 26:13 “The man grew rich…” So he left to find another place. This is reflective of the previous story of Abraham and Abemeloch. Look at page 133 verse 22 where Abemeloch is referenced. LL: What is the back story? Rich folks usually aren’t asked to leave town. PG: This is usually a question of power – who is in charge and suggests a border dispute between two nations. The Philistines are a people with an army. The Israelites or Hebrews – represented by Isaac – are being pushed off disputed land. How has stopping up the wells helping Abemeloch? 26:18 Isaac re-dug the wells of Abraham but there were disputes as to ownership of the water so he had to dig others. The struggle over water was a historic problem in the near east. There are different narrative traditions woven together here. 26:24 The Eternal appears and another well is dug. This is a renewal of the covenant experienced by Abraham. There is a narrative tension here between the promise and the events. It raises the question, again, as to what is meant by faith. Israel is consistently willing to struggle with the meaning of faith. Consider the story opera of Thais http://en.wikipedia.org/wiki/Tha%C3%AFs_(opera) or the Bunuel film Simon of The Desert. Both are accounts of hearing a voice that first says ravish and then offers consolation. Shira – is the voice God or Conscience? 26:26 Abemeloch seeks a treaty – seeing that Isaac is the “blessed of the eternal…” “Sheba” means an oath or pact or promise. Beersheba represents the oath. Look again at page 133 verse 22 which is the parallel story in Abraham. Abemeloch in the Abraham version denies responsibility for filling in the wells. Here the reference is to “sheva” which means seven rather than “sheba”. The details are different. SF: What is the message of Torah here? Why are Abraham and Isaac blessed? Is it because they made an effort to avoid conflict? PG: It suggests that we should order our lives in this manner – conflict avoidance. But it takes two sides to enter into a treaty so Abemeloch gets some credit as well. There is a political aspect here that plays out in Deuteronomy where they enter the land and wipe out the pagan Canaanites. Scripture is not systematic; it is dialectic suggesting different approaches to problem solving. Remember that Israel will be a very small people among large nations and must learn how to survive. But our ideals and aspirations are constantly dashed by reality. The notion of doing well by doing good is a freighted issue. LL: This was one of the essential tenets of Protestantism. JB: Is there a sense of luck in the Torah? PG: It is not “Mozel” as such but consider the Book of Esther which involves the tossing of lots. Mozel is the notion that there isn’t any luck just metaphysical forces beyond our understanding. There is resistance to the notion of randomness in life that is a subject explored in the Talmud. The issue is not how we got to this place but how we move forward. Going forward is not only the burden of the individual but the community. LL: How did Abraham, Isaac and Jacob self identify. Here we have intermarriage with the Hitites. PG: The term “Iberu” refers to a wanderer. See footnote on page 178. 27:1 Isaac grows old and summons Esau for his blessing. Rebecca was listening and told Jacob. She suggested that he fill in for Esau and get the blessing. See Rabbi’s posted essay on bait and switch where there is a higher purpose. Rebecca knows something that Isaac does not – that Jacob will be the carrier of the covenant. LL: why did Rebecca have to become involved here if she knew that Jacob was chosen by God? Note that the word Jacob means “heel.” He straightened out – it is the story of an education; a man who becomes Israel – he who struggles with God. This is a bildungsroman. Rabbi R: We start with a song. The testing of Abraham by the sacrifice of Isaac. How could he do this? Was it the end of child sacrifice? Arguably it is a testing of both Abraham and of the child. Note that Abraham returned home alone. LL: One view is that this is an account of the tension between absolute faith and reason. The reader in ancient times would have had the same immediate reaction of horror that a modern reader has. “God tested Abraham…” is a very specific reference and test. Adam is tested in the Garden of Eden. And Job is tested by Satan – albeit several centuries later. SF: We are all constantly tested so that we can exercise free will and achieve a higher level of being. AF: A test is something that happens after a lesson to see if the instruction has been successful. R – the method of testing can also be questionable – the test may not have a proper ethical and moral foundation. This is not God depicted as a moral and ethical entity. We are being instructed by the story itself. But shouldn’t Abraham have just refused to do it? If he had immediately refused wouldn’t he have passed the test? Or is the lesson, from the orthodox perspective, that he met the test of absolute faith. MS – Abraham learned that God is more complex than just following orders. HF: This story of testing and sacrifice is read on the high holy days. So it is recognized as a rich, important, albeit ambiguous text. JudyC: Our understanding of the text changes as the reader changes from childhood to parenthood to old age. R – There are three basic lessons here: the world depends on Torah, sacrifice/service and loving kindness. Some words are trivial, simply to serve their purpose in an overall line of communication. But there are some words that are powerful all by themselves. Such is the word which is the subject of this “President’s Article.” The word is FORGIVENESS. A little over a month ago we gave particular attention to concepts associated with forgiveness during Selichot and the High Holidays. We dedicate our holiest ritual to the need to give and ask for forgiveness, and we associate forgiveness as being one of the quintessential qualities of the Holy One. It’s not by coincidence that I chose this word. I’ve been thinking about why “forgiveness” is such an important concept for Vassar Temple since I was asked to be Vice President nearly 3 years ago. But I haven’t spoken of it much until recently, because we have many more pressing matters. Considerable progress has been made on many fronts! As challenging as those matters are, they pale in comparison to the challenge we have with forgiveness. In my opinion, forgiveness is as important as our financial objectives, because ultimately our ability to do what is necessary to achieve lasting financial sustainability also requires us to find forgiveness. Look up antonyms for “forgiveness” and you’ll find “blame, accusation, censure” and even” meanness.” All of which produce anger. These negative sentiments are not healthy for either our temple or the Jewish community. You may wonder, where do I see problems with forgiveness? I will leave you, the readers, to look into your heart and answer that question. When we fail to forgive we are trapped in the past, and holding on to old anger. It works like a self-fulfilling prophecy – because it closes our mind to any possible justifications for others’ actions. We invalidate them. And that only feeds our anger and raises the walls we need to overcome to find forgiveness. In order to start to forgive, we first must recognize that we don’t forgive for the other person! We forgive for ourselves – for that which we value! Forgiveness sets us free and opens our mind to new possibilities and potential. It allows us to partner and solve problems together. In addition, when we don’t forgive others we can’t love God to our fullest because part of us is occupied by anger. Perhaps the next time you recite the Shema, which calls us to love the Holy One completely, consider at that same moment the possible value in forgiving others so that you and Vassar Temple can move forward. Nineteen people in attendance. Background: Abraham is informed by God that he should go to the land “that I will show you.” There is a famine and they go to Egypt. Abraham passes off his wife as his sister – a motif that occurs on two more occasions in the Torah. In this parsha we have Abraham the warrior who saves his cousin Lot. 14:1 Four kings against five. Some of these names are symbolic and mean “wickedness” or “evil.” It was not uncommon for local tribes to be battling for resources. 14:10 The kings of Sodom and Gomorrah fall into tar pits. Lot is rescued. AF: How many people were involved in these armies. AR: This is more like tribal warfare. See footnote 14 as to the number 318. 14:12 This is one of the first references to “Hebrew” and Abraham is still “Abram.” See the notes on p. 106 about what it means to be a Hebrew – a word used for wanderer among other things. AR: They had tassels on the edges of their skirts.http://en.wikipedia.org/wiki/Biblical_clothing See also Gleanings on page 114 and the reference to Gematria giving numerical significance to letters in the name Eleazer.http://en.wikipedia.org/wiki/Gematria This has been the subject of much mystical speculation. MS: What impelled the mystics to take the numerical approach? AR: We have been studying all of this for 5000 years. Numerology has been a big part of that study. Also, remember that a shepherd was the tough guy in ancient times. To bring a group of shepherds was to mount a formidable force. 14:15 At night he deploys his forces against them… He is victorious and the king of Sodom comes out to meet him. Abram gives him a tenth of everything. “The most high” could refer to the chief god of the Canaanite religion. There is archeological evidence of a god called “El” worshiped by the Canaanites. BR: Is this an early motze? AR: It could be read that way or it could refer to another cultures traditions that were adopted. Rashi thought that the 318 referred to just Eleazer. SF: The message here is that Abraham acted with force where appropriate – he did what was right. He is rewarded and blessed. AR: There are several messages here. We don’t know if there was any actual violence. He may have just restored order. SH: This seems to be an example – that we see repeated throughout – of a small minority prevailing. AR: This also poses the quandary of what one does to rescue hostages. The American policy is not to pay ransom. Israel will pay even for a person who was killed so that he can have a proper Jewish burial. LL: It would be handy to have Friedman’s “Who Wrote the Bible” here snce he seems to be able to identify the different traditions that were merged by the redactors. AR: Note that some Torah study groups use a variety of Torah sources for these study meetings. It can get chaotic. Salkin said the story of Abraham smashing the idols is at the core of “what it means to be an heir of Abraham and an heir of the prophet. Judaism should not be the affirmation of what we already believe; it should challenge us in some way. “I’d always suspected and had always known that we Jews are a people that have rejected easy truths and accepted wisdom. What I found surprising was how that pattern of thinking has resonated throughout Jewish history,” he said. One area that The Gods Are Broken! examines is the origins of anti-Semitism. Salkin argues that “Judaism’s moral excellence” and “ability to say no to the dominant ideology” have been provocative factors throughout the centuries.